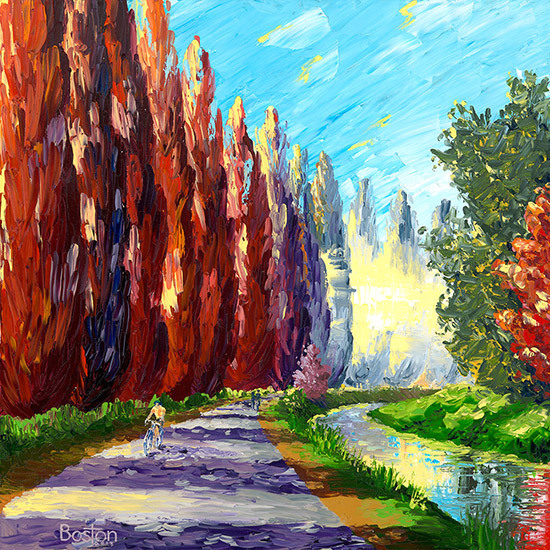 The original oil painting is painted on hand-stretched cotton canvas, 24″x24″. My palette knife impasto painting technique creates a lively textured surface, with really thick paint. I love to ride bicycles, and there is a riding path out here in the Seattle area that meanders along the Sammamish river in a wide glacial valley. It wanders by breweries and some of our major wineries too. The early morning rides on this trail are so cool with the way the sun comes through the tall trees, and the mist that lingers along the trail here and there. High-quality giclée prints on canvas and archival paper are also available. Please contact the artist.